"Where there's never a dull moment!" 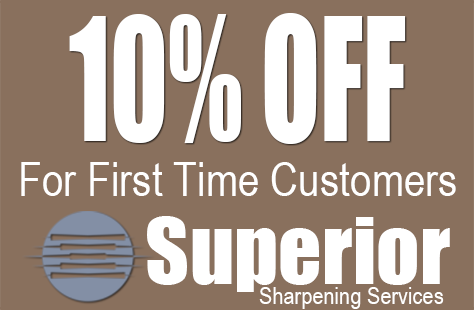 Superior Sharpening Services uses the Perfect Edge™ sharpening system for blade sharpening in Savannah, GA, and surrounding areas. We make every knife perfect, every time! The result is the strongest, sharpest, longest lasting, and most easily maintained edge available! Over the years, thousands of local and mail-in customers have come to us for their clipper sharpening needs. We will clean, sharpen, and properly adjust your clippers. We guarantee that you will receive a clean, sharp, properly adjusted clipper blade every time. Improper shear sharpening degrades the performance of beauty and grooming shears. Using the Kuda Torsional Edge Technology™ sharpening system, our professionals keep your shears in top condition. Sharpening Services for Tools, Knives, Shears, and Much More. 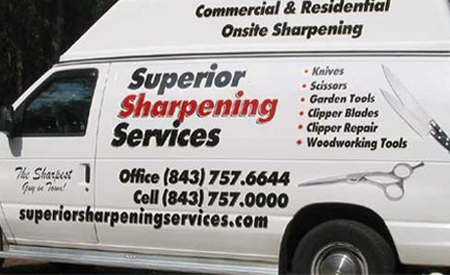 Superior Sharpening Services in Bluffton, South Carolina, offers mail-in, drop-off, and mobile on-site blade and knife sharpening services. We have been in business since 2004, with 40 years of sharpening service experience. We believe that working with properly sharpened knives and kitchen equipment is safer, reduces waste, prolongs the shelf-life of delicate fruits and vegetables, and enhances the final appearance of the dishes you serve your family.